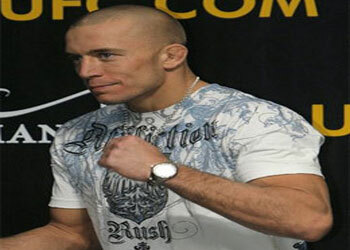 Is it UFC welterweight champion Georges St-Pierre, or is it Gatorade “G”? As of last weekend, both are “G,” as GSP has joined an exclusive list of premier athletes to promote the popular sports drink. Gatorade began their “G” campaign during Super Bowl weekend back in January, and coincidentally it was the same weekend that St-Pierre defeated BJ Penn in their highly anticipated rematch at UFC 94. The French Canadian will be joining the likes of Michael Jordan, Tiger Woods, Derek Jeter, Peyton Manning and Mohammad Ali as a spokesperson for Gatorade’s “G” campaign. St-Pierre marks the first mixed marital arts fighter to be sponsored by the popular sports drink company, another indication that MMA is inching closer to mainstream acceptance. He shot his first “G” commercial last weekend.